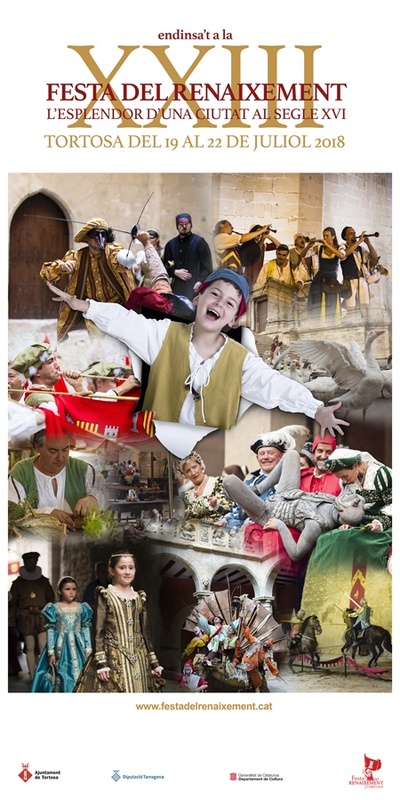 We already have the poster of the XXIII Renaissance Festival! Artist Marta Viladrich wanted to work with the concept of going into the Festival. In his words "the main character, the child, who, in a friendly way, invites you to enter the party in a" literal" way, tearing the paper, entering the party and dressed for the occasion. The selection of photos has taken into account that there is a representation of the different themes that characterize the festival: theater, music, events, daily life ..., etc., as well as the emblematic spaces of the city such as the cathedral, royal colleges, square of the pains, palace of the bishop, walls ... "
The XXIII Renaissance Festival will be held from July 19 to 22 in Tortosa and soon we will be giving out more news. You can customize your computer with festival pics.